Cuban rum and hand-rolled cigars may be closer than you think with new nonstop charters flying from Los Angeles International Airport to José Martí International Airport in Havana. 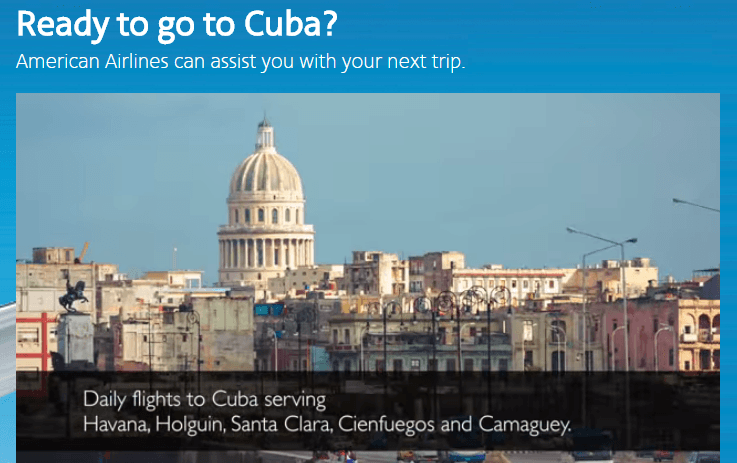 The new route, offered by American Airlines and charter flight operator Cuba Travel Services, is slated to start on December 12, with Saturday flights to Havana. With the easing of travel restrictions, charter flights offer travelers an easy way to get to Cuba. Before this year, the only way that Americans could get to Havana was by flying through a third country, such as Mexico or Canada. That made the trip longer and pricier than it needed to be. With charter flights, it’s much easier. American Airlines will fly a total of 22 charter flights per week to Cuba from three U.S. cities: Tampa, Miami and Los Angeles. While some of the flights will go to Havana, others will fly to Holguin, Santa Clara, Camaguey and Cienfuegos. Flights between Los Angeles and Havana will use American’s Boeing 737 aircraft, which seats 160. This aircraft features Boeing Sky Interior (BSI), which includes cove lighting, sculpted sidewalls and modified windows, making it feel more spacious and welcoming. And the new, updated luggage bins are modeled after the Boeing 787 Dreamliner’s: They pivot down and out, for easier access and modern styling. Cuba has become a hot destination since travel restrictions have been eased. Travelers are drawn to this recently off-limits destination in part because of its old-world charm. While in Havana, you can walk the El Malecón, a popular esplanade running along the ocean; get a taste of glamour in Old Havana; and check out the stunning and imposing Catedral de San Cristóbal. You can also indulge in the spicy local cuisine, smoke a world famous Cuban cigar, soak up salsa music, explore open-air bazaars and enjoy the city’s festive nightlife. Including Havana, American will add nine new international flights from Los Angeles this year. In addition to a second daily flight to London’s Heathrow Airport, the airline has added Guadalajara, Mexico City, Mazatlán, Vancouver and Belize to its destinations. Pending approval, Sydney and Tokyo-Haneda will be added to the list.